Timeless woodgrain carriage house styles. Colorful attention-grabbing contemporary accents. Statement-making designs with eye-catching appeal. During National Curb Appeal Month in August, experts at Haas Door recommend that homeowners open themselves – and their garage doors – up to the potential for endless possibilities of enhancing the curb appeal of their homes. At a projected 91.5% cost recouped, a new garage door almost pays for itself when selling a house. Tip #1 – Step back. Before selecting a garage door stand by the street and look at your home overall. Now, think about the style of the home exterior, the colors on the house and the textures. Determine what kind of garage door – smooth or woodgrain – and what color or texture would best complement your home’s overall exterior. Tip #2 – Light or no light? 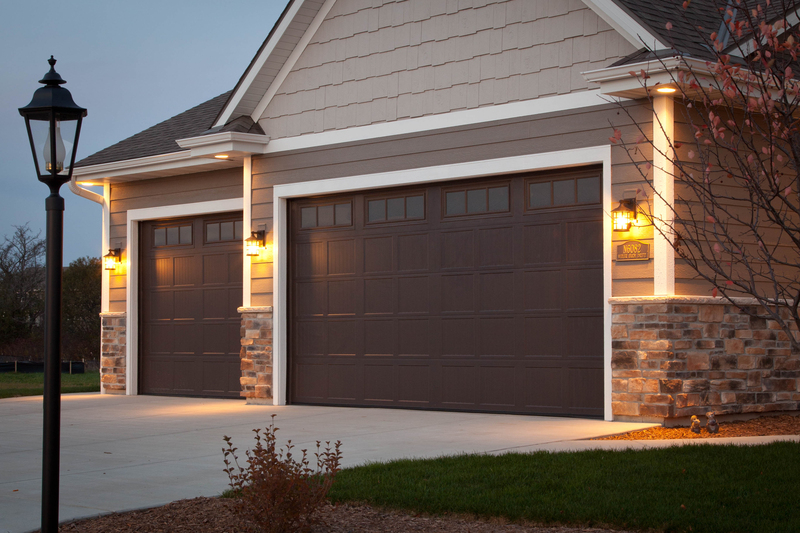 Decide if you’d like a solid garage door or one with windows to allow light into your garage. If you choose windows, look at the style of windows on the front side of your home (including the grids) and look for a garage door with similar window styles. For example, if your home has lots of small window panes, then look for garage door windows with grids that replicate the look of smaller panes of glass. Tip #3 – Be practical. Select a garage door that can handle weather conditions for your geographic area. For instance, a 5000 Series door can stand up to Mother Nature, even in Florida conditions, with its corrosion-resistant aluminum, thick insulation and weather-resistant paint finish. Tip #4 – Stand out … or stand back? Decide if you want your garage to be a stand-out focal point when looking at your house or if you want it to blend in with your home’s style. There’s no wrong answer. Oftentimes a stand-out door, like one in an elegant Craftsman style with a wood grained finish, can add visual dimension and appeal to a home exterior. Or, a door in a painted bronze color can stand out beautifully against a stone veneer home facade.